Galls are irregular plant growths which are stimulated by the reaction between plant hormones and powerful growth regulating chemicals produced by some insects or mites. 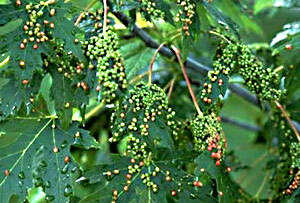 Galls may occur on leaves, bark, flowers, buds, acorns, or roots. Leaf and twig galls are most noticeable. The inhabitant gains its nutrients from the inner gall tissue. 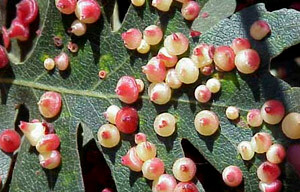 Galls also provide some protection from natural enemies and insecticide sprays. Important details of the life cycles of many gall-makers are not known so specific recommendations to time control measures most effectively are not available. What is a plant gall? © 1999 All rights reserved.